My first ACL injury was October 13, 2007. I was playing volleyball for my high school team. At this time, I was 14 years old. I tore it when I landed from blocking a serve. I did not hear it "pop" and was not in much pain. I even tried to walk it off, not knowing that it was my ACL. (My "main" sport is track, I am a sprinter with national speeds). I am a good athlete and enjoy volleyball and basketball, as well. I was just a freshman, so I decided to play as many sports as I could before narrowing down to my favorite, and what I did best. I soon found out that it was my ACL. You can imagine the shock and disappointment of knowing that I would not be able to run track that school year or play basketball. I had my surgery 1 month later. 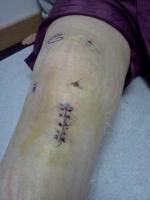 I kept doing exercises before my surgery to make my ACL as strong as possible. After surgery was many months of rehab. I went through an ACL prevention program after rehab. and did many "extra" programs to make sure I was back to full strength. During this time, the basketball coach wanted me to feel part of the team, so he put me on the varsity roster and I went to every game and every practice, knowing that I would not be able to participate. But, that was fine. I had a goal to be on the team the next year. I played summer basketball, while working on my sprint speeds. The following school year, I went to early morning "shooting" times for basketball and worked out with some of the team twice per week before practice and tryouts "officially" started. I did not try out for volleyball, for I was nervous and scared of tearing my ACL again. Well, guess what... The first day of official tryouts, 2 hours into the practice, I was going up for a lay-up and a girls knee hit my MCL in the air, at just the right spot. The impact of that tore my MCL and I fell in pain, and tore my ACL. This is all on my other knee. This just happened on November 3, 2008. All that hard work and dedication has ended my athletics once again. It was a "freak" accident and was from contact. At the present, I am waiting for my MCl to heal before I have my ACL surgery. The surgery is scheduled for December 30, 2008. Another track season gone. I am a sophomore now and only have 2 years left of high school. I will not play any other sport and get ready for the track season of 2010. Gosh, that is so far off. The doctor said there was only a 6% chance of this happening so soon. Why???????????????????? ?